Looking at all the choices in lighting can be overwhelming! Finding your personal style, checking the proportions, and fitting your budget – these are all things to consider. We help make this process easy with our 1, 2, 3 approach to finding you perfect lighting at great prices. We offer lighting from Kichler, Progress, Sea Gull and specialty lighting companies to provide you a complete assortment of light fixtures for both indoor and outdoor use. Our pricing is very competitive. Our customers are often surprised at just how far their budget can go. We'll find the perfect lighting family for you. We recommend choosing a lighting family and carrying pieces from the collection throughout your home for a cohesive, unified look. 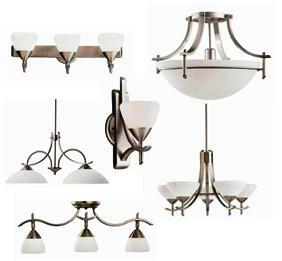 There are several lighting families in our online store. Also, check out our Lighting Photo Gallery for inspiration. You'll receive one complete quote with all your fixtures listed. Plus, we can include under cabinet lighting, utility fixtures for garage or workroom, outdoor fixtures and more. Plus, we can consolidate your order to ship with other building supplies you order. Visit our Shipping page to learn how we can help you SAVE BIG on shipping. New Global Sales Web Site!